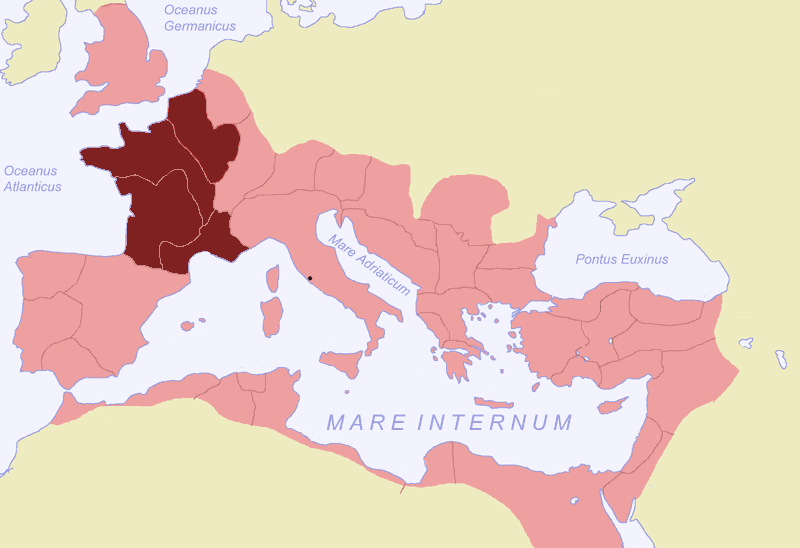 Gallia - roughly modern France & BeNeLux - was subjugated by the Roman Republic in a series of campaigns which started in 121 BC, and finished with Julius Caesar's Gallic Wars from 58-51 BC. In 22 BC, the region was reorganized resulting in 4 distinct provinces; Gallia Narbonensis, Gallia Aquitania, Gallia Lugdunensis, and Gallia Belgica. The provincial capitals were Narbo Martius (Narbonne), Burdigala (Bordeaux), Lugdunum (Lyons), and Durocortorum (Reims), respectively. Culturally, Gallia was divided into Gallia Comata, literally meaning ‘long-haired Gaul’, and Gallia Bracata ‘trousered Gaul’, which refers to the use of bracae (‘breeches’) in Gallia Narbonensis. During Late Antiquity, Gaulish and Roman culture amalgamated into a hybrid Gallo-Roman culture. The Gaulish language was marginalized and eventually extinct, being replaced by regional forms of Late Latin which in the medieval period developed into French and Occitan. (19) Constantine I 316 A.D.
(30) Constantius II 347-355 A.D.
(74) Tetricus II 273-274 A.D.